If you're like me you have your favorites -- but sometimes it's nice to try something different. Not too many online casinos have games from Rival Gaming so they're a nice alternative to the usuals. They've just launched their new Thunderbird slot game and Slots Capital and Desert Nights are the first online casinos to offer it. Until Saturday, August 20th, both casinos will quadruple your deposits to give you plenty to play the new game with. 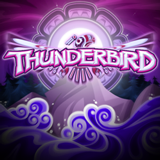 Thunderbird features an expanding wild with 2x multiplier during free spins. When the Super Spirit Round is triggered during free spins, the first reel is always wild. Valid until August 20th only. 300% casino bonus available to try the new online slot game. The Eagle – or Thunderbird – has long been a symbol of courage, wisdom and strength for native North Americans who believed the high-flying birds to be sacred. The symbols on Thunderbird slot’s reels include a drum, a woven hat, fir cones, feathers, a bear mask, a face carving, a serpent and a fish. Thunderbird is a 5-Reel, 50-Line video slot now available online and in the mobile casinos at Slots Capital Casino and Desert Nights Casino.